The paintings of this exhibit are the beginning of my first thematic series. I hope to put forth work that places one into what I feel is most important about the rich Southern land, particularly South Carolina. Carolina is a land of all the romance and tragedy of a classical kingdom. A thriving country that enlivens us with its many green splendors and quiet life. For me, it is easy to see how the mundane is divine here. Even though I come from a very distant land, I can proudly say that I’ve been greeted with open arms and that I’ve found a heavy and deep majesty much like the birches, firs and meadows of my Russian childhood. Over the past fifteen years, I have come to embrace the liquid laziness of South Carolina. Her crocodile smile and relaxed aggressiveness is particularly “chilled out” as an underlying stubborn humor radiates from all the people. And how many different types we have! There are the Good ol’ Boys and Brothas, Bluegrass musicians and Irish travelers, Mountain folk and haunting Gullah storytellers. Like the proud Cossacks of Southern Russia, Carolina has given birth to America’s most patriotic and rebellious sons. The tenderness and emotion of all its resilient and tenacious people has shaped Carolina’s muscle. I’ve been to very many places and I can say South Carolina is most worth praising. The all-famous Southern Hospitality has welcomed, groomed and inspired me to pursue the Muses in life. From the fresh mountain springs of the Blue Ridge Mountains, down through the muddy rocks of the Piedmont, to the sluggish purls of the Low Country swamps, the blood of the South runs through its craggy vines, branches, and finally, through all of us. Throughout the nation we are known as the state of hicks, grits and screaming fiddles and banjos, and let us accept these as our proud banners. 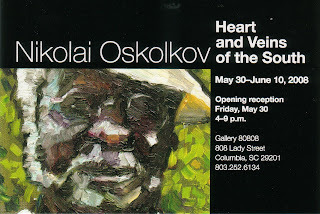 Nikolai Oskolkov is a painter and musician of Russian origin based in South Carolina. He explores the endless opportunities of representational painting and drawing and strives to find the meaning and purity of art in the modern world. A graduate of the University of South Carolina, he has received the highest awards in USC’s annual student exhibits and was a representative of USC’s Magellan Scholarship program. He is also active as a musician. A self-taught performer of the Russian folk balalaika, Nikolai combines Slavic, Gypsy, and American folk traditions in music. Being an extensive traveler, Nikolai believes in the divine ambiance of the various environs of our planet, and how surroundings and circumstance contribute to the positive formation of an individual. Of the many places in the world, the majesty of the American South has a special place in his heart. Dixie is the land that is his second home, whose famous “Southern Hospitality” has raised, inspired and has given him the opportunity to contribute to the Muses. The “Heart and Veins of the South” is an exhibit of his first works about the great Southern land and its people.